Control Resources had been providing a special SmartFan TachScan-9 fan failure alarm used in a telecom cooling fan tray. The customer encountered a problem with some international installations. 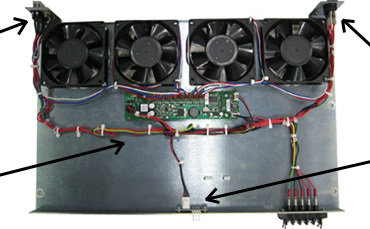 In some countries, the supply voltage was spiking and damaging the 24 VDC fans used in the telecom cooling fan tray. CRI visited the customer and offered to develop a custom version of the TachScan-9 fan failure alarm that would regulate the voltage to the fans eliminating the potential telecom cooling fan tray damage. to new custom fan tray control and fan failure alarm board. Eliminate fuse cable.Optimize cabling to reduce material and labor cost. Eliminate seldom used power switch and cable.Eliminate fan failure alarm PCB and cable. 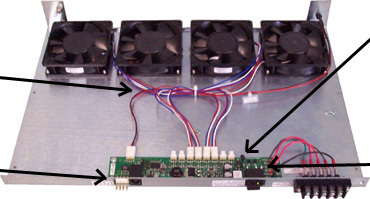 Fan failure alarm function will be provided on the new custom fan tray control and fan failure alarm board. CRI’s telecom cooling solution was dramatically less expensive than the existing telecom cooling design with no mechanical changes needed. CRI provided a free evaluation of the telecom cooling fan tray. The result was a cleaner, easier to assemble custom fan tray. The revised custom fan tray pricing was about 20% below the customer’s cost target. With minimal effort for the customer, CRI evaluated the design, proposed and implemented improvements and is now producing the complete custom fan tray. A Win-Win solution for both the customer and CRI. Less expensive, easier to install cabling. Fan failure alarm connection circuitry now integrated into the custom fan tray control and fan failure alarm board. Custom fan tray control and fan failure alarm board with voltage regulator to protect fans.Fuses now integrated into the custom fan tray control and fan failure alarm board.